Poker is a game of skill and using the ability to read situations and opponents to give you the advantage in each hand you play. It is also a game of mathematics, where you should be able to calculate the odds of either you or your opponent winning the hand in any situation. Check out the Mathematics of NL Hold'em series by WiltOnTilt from Deuces Cracked. It's by far the most comprehensive and easy-to-learn traning series for NL Hold'em mathematics and covers all of the topics above. Does the use of poker mathematics make you a winning player? It is a common question; it is possible to beat the game without incorporating poker mathematics into the plays you make? It cannot be assumed that people who do not use mathematics will not be winning players, but a sound knowledge of odds can only improve your game, and give you an advantage over players that do not use them. Almost all players use mathematics in their game without realizing that they are doing so. For further reading on this topic, check out the article on the importance of mathematics in poker. Where to use mathematics in poker. Using mathematics for drawing hands. Mathematics can be used in many different situations; however, they are most commonly used when a player is on a draw such as a flush or straight draw. If an opponent makes a bet and you are on a draw, you are faced with the decision of whether or not you should call to try and complete the draw by the next card, or fold and let your opponent take the pot. In this situation a player that has good knowledge of poker mathematics will always know whether or not to call, whilst a player that has no knowledge of mathematics will be unsure. Players who are unfamiliar with poker odds will make an educated guess on whether or not they should call. If the bet is large, they may feel that it is too expensive to try and catch the right card, but if the bet is small they will be more inclined to call. On the other hand, a player that can use poker mathematics correctly will be able to work out the pot odds they are getting on the hand and act accordingly. Pot odds take into account the amount your opponent has bet in relation to the pot, and the likelihood of completing your draw to inform you about whether or not you should call or fold. There are other situations that incorporate mathematics a little more loosely, but still incorporate them nonetheless. The following situation is an example of ‘Expected Value’. Say for example you are on the river holding bottom pair and your opponent bets $4 into a $10 pot, what should you do? If you have no concrete evidence from the way the hand played out about whether or not your opponent has a better hand than you, you can use mathematics to determine whether or not you should call. 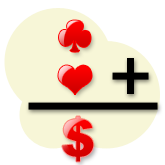 Example of using mathematics in poker. If you're having trouble getting to grips with drawing hands and odds, try using the handy SPOC tool. A key point to remember when using mathematics in poker is that the decisions you make will not have an effect on your winnings in the short term. Just because you work out the odds in a particular hand and make the correct call it does not mean you are going to win the hand. It also does not mean that you have made the wrong decision if you lose the hand. If you keep making the right decisions based on odds you will be making more money in the long run, so try not to let results in the short-term have an effect on you making the correct plays. Learning how to use mathematics in poker can be a difficult process at the start, but we highly recommend that you keep trying, as it will help you to become a long-term winning poker player. After a while things will start to ‘click’, and you understanding of pot odds and expected value will become a lot easier. More information on poker mathematics. If you want a very thorough book on poker mathematics, look no further than The Mathematics of Poker by Bill Chen . It's not an easy read, but you won't find more information on poker mathematics anywhere else (no, not even on ThePokerBank! ).